Chennai, March 8th. It was the anniversary of my mother’s passing yesterday. Every year we light a yartzheit candle for both of my parents’ anniversaries, even though they weren’t Jewish. We figure they wouldn’t mind. Yesterday, I forgot. We were so busy packing for our trip to Chennai, and working on our presentation for the Fulbright conference, that it totally slipped my mind. I remembered at 6:30 this morning when we were in the cab, heading to the airport. 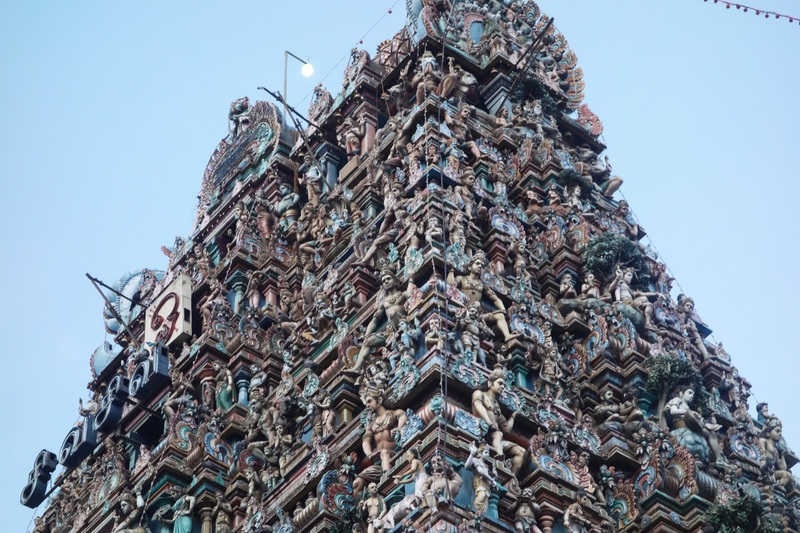 In Chennai, Kala and Shyam took us to the Kapalishwar temple, an architectural and spiritual marvel in the usual intricate, South Indian style. It was huge, with dozens of shrines for Vishnu, Balaji, Ganesh, Shiva…. I saw a woman take out six tiny earthenware pots, fill them with oil, coil a wick inside each and then light every one of them while reciting a silent prayer. 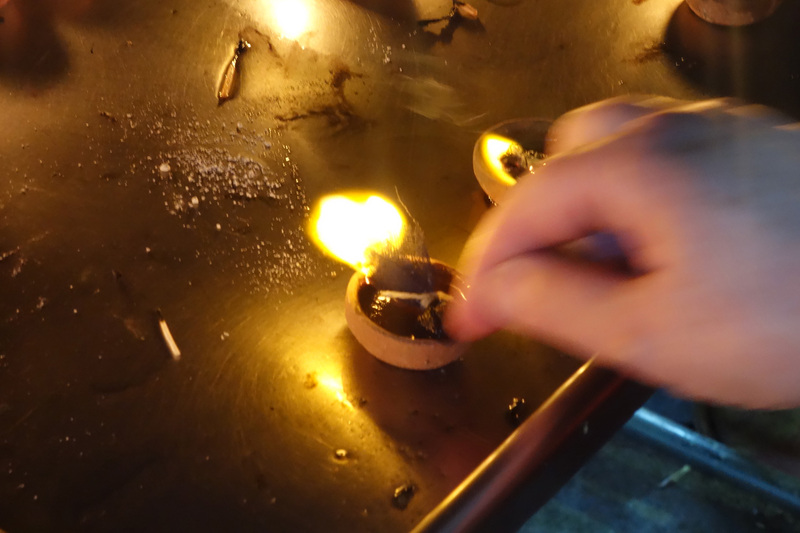 There were dozens of similar candles lit on stainless steel tables in front of each of the deities’ shrines. I thought to myself: why not? I asked Kala if it would be OK for me to light a candle for my mother, since I had forgotten to do so yesterday. She said: “Why not?” Shyam went and got 2 pots, each with oil, containing a small mesh packet of mustard seeds with a wick sticking out. I thought the other would be for good fortune for our project. I thought “Ach, my mother would die if she knew where we were and what I was doing.” But she’s already dead. Since my mother loved elephants, I thought Ganesh would be the most appropriate god. We found a stray match. I lit one candle – “That’s for you Mom,” I said to myself silently. I lit the other pot, but the mustard seed bag flipped over and the flame went out immediately. I tried lighting it again, risking my fingers burning. It wouldn’t stay lit. “Your mother’s fighting it,” Alan said. “Oh, but I lit the first one for her,” I said. “Nah, this one’s her – she’s fighting.” I liked his version better. The first pot was burning steadily. Eventually the second pot gave up and stayed lit. We said Kaddish. My mother would have died. 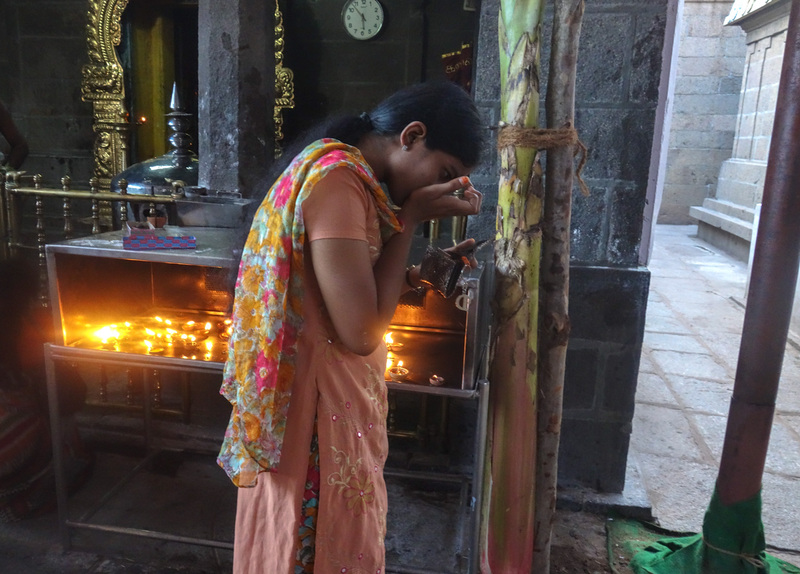 This entry was posted in Uncategorized and tagged Anthropology, candles, Chennai, cross-cultural, Ganesh, Hindusim, India, Jerri Zbiral, Judaism, kaddish, Shiva. Tamil Nadu, travel, Vishnu, yartzheit by alanteller. Bookmark the permalink. G-d bless mothers who still exert their presence years after they have left this plane! I had one of those and she would have smuggled her way into your luggage to join your adventure. Thank you over and over again for sharing your adventure with all of us. Thanks for reading it and joining in on the adventure! Wonderful story! I light candles when I remember too, often not on the appropriate day. At least I remember. And I had an experience like the one you describe in Puebla, Mexico. I’ll share it with you one day.